Story of Parashurama, part 1. 'Whenever righteousness is on the wane, and wickedness gets the upper hand in the world, I take birth in this world to protect and re-establish dharma', said Sri Krishna in the Bhagavad Gita. Accordingly Bhagavan Vishnu took a number of incarnations on his own accord and we read about these incarnations in our epics and books on history. The following incarnations are well-known Matsya, Kurma, Varaha, Narasimha, Vamana, Parashurama, Sri Rama, Krishna, Buddha and Kalki. These are called the ten incarnations of the Lord. Among them Parashurama was the 6th and Rama was the seventh incarnations. Among the ten incarnations, Parashurama's story is special and an attempt is made here to narrate the same. Parashurama was born in the Bhrigu clan. His father Jamadagni was famous for his devotion to tapas and good conduct. His mother was the daughter of Prasenajith, a famous Rajarshi. They named their son Rama. 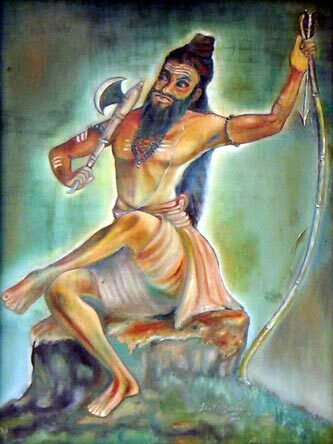 Later, he destroyed the clan of Kshatriyas by using his divine axe, therefore (Parashu means axe) he came to be called Parashurama. He was also called Jamadagni Rama because he was the son of Sage Jamadagni and Bhargava Rama because he was born in the Bhrigu clan; but we know him by the very commonly used name Parashurama. He was the fifth son of his parents. Jamadagni was the son of sage Richika, a very great sage, He was acclaimed as one of the greatest among the sages of his time in respect of his scholarship. He had mastered Brahmavidya and along with it he was an expert in archery. Renuka, his wife would follow him like one's shadow in all his righteous activities and serve him with great devotion. The couple loved each other and they were considered a model couple. Parashurama was loved by his parents very dearly. His parents were highly righteous He was quick to learn everything taught to him. At a very young age he mastered all that a devout brahmin should learn. Besides these he mastered archery with the help of his father. He reached the peak in whatever he did. He performed tapas to please Lord Shankara and received from him a number of divine weapons and mastered the use and retrieval of the same. His greatest weapon was an axe. His father Jamadagni gifted to him the Vaishnava dhanus (bow) which he had received as one of the ancestral possessions. As a result of the benefaction of his teacher and parents, he acquired extraordinary power and skills and became invincible. He was born in the clan of Brahmarshis consequently the question, whether it was proper for him to master arts to be mastered by kshatriyas. But dharma does not bar one from acquiring such skills when a person does not use them for achieving ones personal ends, but for protecting dharma under unavoidable circumstances. Dharma permits the use of both brahma and kshatra powers to put down and control wicked powers in the world. The lord was born in the form of Parashurama only to achieve this end. The family life was going on as usual and there was plenty in everything they had. There was happiness and contentment all around. One day the children went to the forest for collecting flowers fruits and roots. Renuka who followed all the religious ritual, very faithfully, went to the river to fetch holy water. She had bath and filled her pot with holy water for the Pooja. As she was filling the pot, her attention was drawn by the scene at a distance from her. The king of Gandharvas, Chitraratha was having a bath along with some apsara women. He had a garland of lotus, flowers round his neck. It was an unfortunate moment in poor Renuka's life. Might be it was the beginning of the tragedy awaiting her. When she looked at the gandharva and the women, her mind lapsed into an unusual desire for carnal pleasures. In a fraction of a second she realised her mistake, repented for it and hurried back home with the water pot. She was a bit late. She was trembling with fear. A punishment worse than she had expected was waiting for her. Jamadagni found out her mental adultery and ordered his children to cut her head off. Parashurama was not in the ashram at that time. The other sons did not carry out the father's order. The sage was angry with them and cursed them saying, "May you become dull headed like animals and birds." Immediately they lost their human qualities and became for all practical purposes animals. At that time Parashurama returned to the ashram. He was shocked to see what was happening there. He was asked by his father to kill his mother. Parashurama, who was aware of his father's extraordinary power and fame as a great sage, killed his mother and brothers. Jamadagni's anger subsided and he cooled down. He said, "Your love and respect for your father is unparalled. No one else except you would have agreed to do this act. I am pleased with you. Ask for anything you want." Parashurama said, "May my mother and brothers get up as if from sleep. Make them comeback to life. Let them forget the fact that I have killed them. Let my brothers get back their wisdom. Let mother forget the mental sin she had committed. Let no one be able to conquer me in a battle. Let me live long." Jamadagni said, "So be it". Thus the dead brothers and mother came back to life. Karthaviryarjuna was a brave king ruling from the city of Mahishmathi. He was righteous. He belonged to the clan of Haihaya. He had a son by name Arjuna. He was the incarnation of divine Sudarshan, the weapon of Lord Mahavishnu. When this Sudarshan became very proud at the idea that the Lord made him born as this Kshatriya prince to teach others all secrets of creation, he lost reason. He had great wisdom and strength and all the other qualities which Sudarshan had. He had one thousand arms. He was also called Sahasrarjuna on that account. He was taught all the arts by another of the Lord's incarnations, Dattatreya. He became an expert in every art he was taught. One day Dattatreya spoke to him blessing him and also sounded a word of caution to him saying "My dear disciple, you are going to become unequalled in fame. But as an ordinary mortal you will commit a few sinful acts and another of god's incarnations, a great person would slay you. Be careful." Sahasrarjuna grew up to be a very highly righteous and brilliant king and at the same time a great tapasvi. When his father died he ascended the throne and began to rule the land efficiently. He was such a powerful king that he defeated Ravaneswara, the Lord of Lanka, who had conquered all the devas, and kept him a prisoner for some time. No one in his land had the courage to behave against dharma. Everyone in his land was mortally frightened of him. Even if someone thought of sinful acts, the king would come to know about it and appear before such a person and frighten him out of such thoughts. Kalidasa, the great poet makes references to the king's extraordinary qualities in his great epic Raghuvamsha. Shastras tell us that in Karthaviryarjuna's kingdom, if a person loses anything, if he just remembers the king he would get back the thing lost immediately. In the Agamas we have a hymn called Karthaviryashtothra, which praises him. Even such great men make silly mistakes in a moment of weakness. With the help of this king Agnideva burnt the ashram of a sage called Apara. He went to the ashram of sage Jamadagni and after enjoying the hospitality of the sage, arrogant as he was, he took away all the cows that belonged to the ashram by force. This incident was the cause of his fall. Parashurama was not in the ashrama when the incident took place. On his return a little later he came to know what had happened and was very angry with Karthaviryarjuna straight away he made for Mahishmathi and challenged Karthaviryarjuna to a duel. In the ensuing duel Parashurama cut his one thousand arms as one would cut down plantain trees with ease and finally killed him. That was the end of great Karthaviryarjuna. He went back to Vaikunta and decorated Mahavishnu's finger as Sudarshana chakra once again. Karthaviryarjuna's sons got enraged at the killing of their father. In great great anger they rushed to Jamadagni's ashram. The sage was in the yogic pose. They fell on him and severed his head off and had their revenge. Parashurama was away in the forest collecting samith and flowers, when the barbarous act was committed by the princes back in the ashram. He was shocked beyond words when he saw the terrible scene. He had not even dreamed of such an end to his father. He was unconsolably sad. He felt repentent because he thought that his father met with that terrible fate on account of his killing king Karthaviryarjuna. He was greatly pained when he thought that his father was butchered as hunters butcher wild animals in jungles by hacking them to death. These thoughts plunged him deep into the ocean of sorrow. "My father lived a righteous life. He did not even harm his enemies. He lead a chaste and righteous life and why should he suffer like this? Why did you meet with such ignominous death? When you were in deep meditation, those barbarians attacked you and shot sorrows at you when you were not in a position to defend yourself. Those who committed this crime deserve to be punished in the worst way possible.' He wailed this way for a long time and then consoled himself and completed the last rites of his father. At the end of it he took a historic but a terrible decision. He swore, "I am going to destroy all the kings and princes in the world." Parashurama assumed the role of the destroyer of the world. Then began the terrible sacrificial rite of the kings. Without delay, he collected his weapons and rushed to Mahishmathi. He killed all the sons of Karthaviryarjuna. Many kings came to the help of the princes. All of them were butchered without mercy. Parahsurama's anger did not subside at that. He went round the world twenty one times, killed all the arrogant kings and princes without mercy and thus cleansed the world of all the bad elements. As a result of these terrible killing expeditions, enormous amount of blood was shed and it is said that the blood thus shed was collected in five pools and they came to be called 'Samantha Panchaka'. He gave tarpana to his pithrus with this blood and his soul found peace at last. A great change came about in his approach to life. He became merciful and began to show concern on all living beings. At that stage in his life he left for the forest and began to perform tapas.